Homeowners can lower energy and replacement costs while helping the environment by performing a wood window restoration that fits their buildings’ architecture. When a homes wood windows are in rough shape, many homeowners automatically assume it is time for a replacement of all the windows in the house. However, many homeowners are not fully informed about the issues related to replacement windows and the options for repair. There are good financial, environmental and architectural reasons to put a building’s original windows back to work. Our company recognizes that, if given the option, building owners would rather keep their vintage wood windows than replace them, for this scenario, we offer wood window restoration. We provide products and services that provide the best value for your money and restores value to your home! Older homes typically used valuable fir or cedar crafted wood windows. These older-growth trees means denser, longer-lasting wood. DO NOT replace them. These windows have over the years been considered to be long lasting and the best windows. If your windows are made of cedar, fir or any other high quality hardwood, do not be lured into thinking that you need to replace your existing wood windows, we can perform wood window restoration. Modern Replacement windows aren’t made of quality hardwood materials. This means they were not built to last which will call for further replacement. Vintage windows were built better and although they have drawbacks, we have many options to fix and upgrade your valuable vintage windows to modern standards! Apart from being long lasting, vintage wood windows add aesthetic & monetary value to your home. It is not easy to find high quality wood windows especially hardwood windows, being produced today and if so they are quite expensive. This means that your home will hold more value with the original windows. Instead of replacing them, your existing wood windows can be brought back into great shape and made more functional and more energy efficient, that rivals newly produced windows, while holding more value and beauty by repairing them. Your original vintage windows will be the best at matching the style of your home, with replacement you will lose the character of the home. Wood windows built in 1980-2000 most likely are built from pine. These windows may even have a metal clad covering the wood but are very vulnerable to experiencing extensive dry rot & glass seal failures causing your glass to fog up. Essentially, any area of the building with a potential for wetness, has a greater susceptibility to rot, which eats away the inside of those construction woods hidden from sight, e.g. those beneath floorings, inside walls and/or under roofs. Signs that a building maybe concealing rot includes: fiber with bubbling paint, spongy and soft wood with or without a weird smell, as well as cracking and shrinking wood. While these signs may be observable by the novice eyes, proper assessment of these problems will need pro skills and special tools, and so does fixing and repair. Although they are good name brand windows, they are very expensive to replace. Therefore, you should consider repairing them instead of replacing them. Repairing such windows is cost efficient and maintains the value of your home. It is possible to put a vinyl/plastic window in your home but the value and beauty of your home will be sacrificed. You can repair and maintain your windows for the life you live in your home and not come close to the cost of replacing them. It is incomparable. and replace only what is needed to get rid of the fungus. We offer long term solutions. We don’t do patch jobs or fill-ins. We use full length replacement parts and achieve a tight moisture seal. Foggy glass and condensation between the glass can be a big eye sore. The sad truth is that all insulated glass will eventually fail. Given enough time, moist air will begin to fill the space between the two once-sealed pieces of glass. When temperatures remain consistent, you won’t see this moisture in the glass as much. Once there has been a fairly rapid change in temperature, either indoors or outdoors, will you see any sign of a failed seal. This starts out as condensation between the two panes of glass. Hot days are the biggest cause of seal failure, which is why your south and west facing windows usually fail first. When sunshine hits a double pane window the air inside heats up causing the sealed glass to expand and push air out through the semi-permeable seals. In the evening, the window cools and contracts, drawing air—and humidity—with it. Over time this cycle happens countless times, stressing the window seals and filling the inside air space with visible moisture. 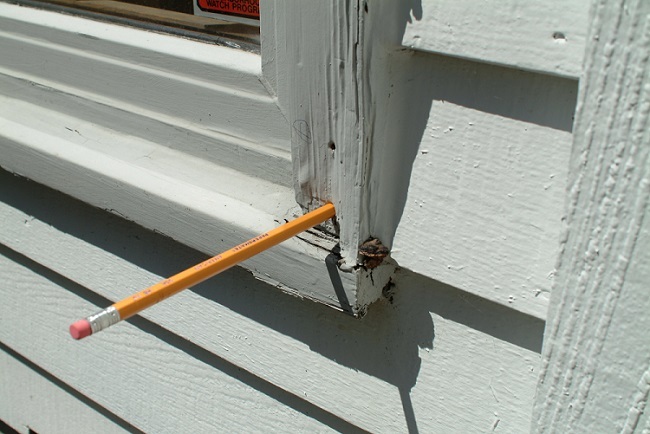 To help hold off seal failure for as long as possible every two years the exterior seam where the glass meets the wood needs to be re-caulked and the frames painted. If there is not a tight sealant between the glass and wood, rain will hit the glass and run down between the wood and the glass, pool at the bottom of the IGU (Integrated Glass Unit) and decays both the seal of the IGU and the wood frame of the window from the inside out. Rust-colored flaking may be an indication of Low-E coating breakdown due to seal failure. Low-E is a protective glass coating that reduces both radiant heat transfer and the passage of ultraviolet rays. Our company provides customers with the leading products and best possible glazing methods for all your glass replacement needs. We can replace your glass and give you options to upgrade to other types of replacement glass such as Low-E, gridded, tinted, and other variations. Glass replacement is far cheaper than full window replacement and the experts at Chosen Wood Windows can do it with relative ease and minimal to no disruption. Environmentally conscious people are opting for restoration over replacement as a way to conserve energy, save money, and reduce their carbon footprint. Window restoration proves to be an effective environmentally friendly way to conserve resources by utilizing what has already been produced. In addition, replacement windows that contain vinyl or PVC are toxic to produce, create toxic by-products and are not recyclable. By repairing, you save your old windows from being thrown in the landfill, and once repaired, they can be maintained for the life of the building. Chosen Wood Windows restores, rebuilds and reproduces sash, wood and windows and doors. Chosen Wood Window ‘s philosophy is to reuse what is good and replace what is necessary. We reuse all the good wood components in the existing window. If we replace the glass with insulated glass, we reuse the distorted wavy glass on other historical projects. Go Green & save on energy costs! By using local carpenters to rebuild original windows, the money spent for the home improvement project remains in the area rather than supporting distant suppliers in other regions or countries. Repairing rather than replacing historic wood windows retains the historic integrity of your home. Remember that historic preservation is based, in part, on the retention of historic building materials.